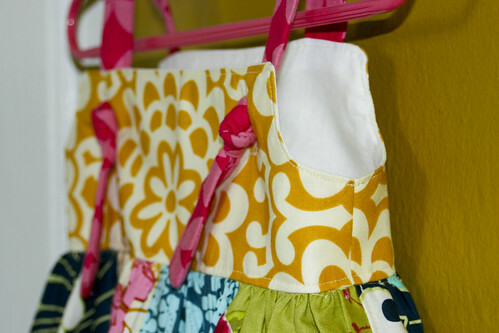 Lori Danelle: maker of things: New Dress for Peyton. . .or Charlie. . . 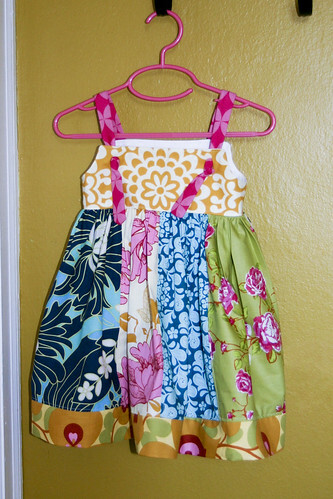 I whipped up a new dress for Peyton the other night. . .however, it just as easily fits Charlie. I'm thinking about giving up on buying clothes specifically for each girl and just have a communal closet for them instead. This plan may not work in the winter with jeans though. Charlie is still a few inches taller. Now I just need to make one for Charlie . . . er, Peyton. . .whatever!! This could get confusing! I wish I could be as crafty as you!! Wish you lived closer and you could make Landrey some dresses!! I could always make Landrey dresses from far away. . .
Lori, This is amazing!!!! Nice job! I also like sewing. Learned as a child and then gave it up for some time and now I'm trying it again. It looks like you are more advanced that I am. Love this dress - so cute. The fabric selection is just so perfect. If I had girls this would inspire me to do something like this. This is a very pretty dress. I just love the combination of different printed fabrics.